Decals : Two schemes, one in bare metal and black from Edwards AFB, the other in typical non-descript black. Comments: Back when MPC was marketing Airfix kits, I bought several of these kits on sale at Kay Bee hobbies for $1.99 planning to do a series of U-2s. Now it is over 10 years later and I have finally removed the shrink-wrap from one to build. It is pretty standard Airfix with minimal interior and wheel well detail, but with the U-2 the interior is barely visible and the wheel wells are quite small. There were typical fit problems with the intakes and a big problem with the wings. Hunks of plastic as big as the wings on a U-2 are just waiting for problems and this kit gives them to you. The bottom piece runs only from the root to halfway and is shallower than one would like so must be reinforced to mate up to the outer part of the wing. Secondly, the blanks that replace the wing tanks are too small and again need a lot of putty/shims to smooth out. There are a number of extra bits to build the bigger intake C model as well as the second `turreted' canopy and bulged payload bay for the D version. Having gotten over that problem, the kit is pretty straightforward. 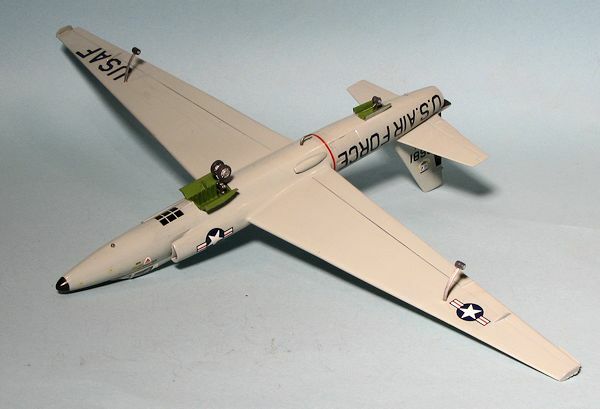 The instructions are generally mediocre so you truly need to know your U-2s to build an accurate model. I used Scale Aircraft Modelling Vol 5 page 588 to get the details down on the version I was building which was a U-2A. Naturally, the kit decals, which were crude at best, were tossed in favor of Superscale decals of similar vintage. The decals worked just fine and I used a scheme in overall ADC grey. A problem with Superscale is that they copied old Microscale instructions, but only copied one side of the sheet. The result is that there is no upper and lower wing decal placement diagram. I do wish that Superscale would put their copier on "two sides". It is thoughtless little things like this that are leading me away from Superscale to their competitors. So, how does the finished kit look. Frankly, it looks nice. Most major problem areas are on the underside of the aircraft so not quite so obvious. I do wish that the outriggers were long enough to allow the kit to fit level, but the kits tendency to lean to one side does allow the kit to fit onto a relatively narrow display shelf. Recommended for those who like U-2s. 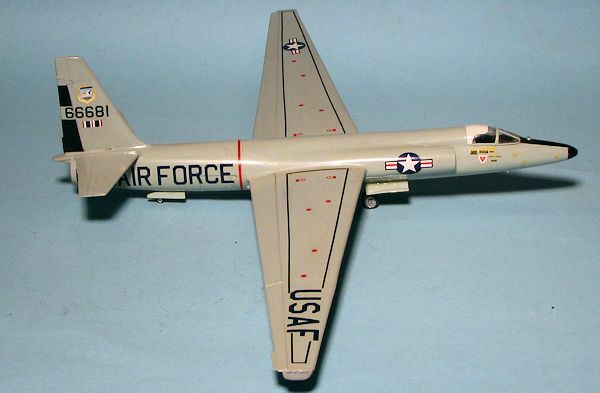 After all, for an early U-2, it is all that is available in 1/72!